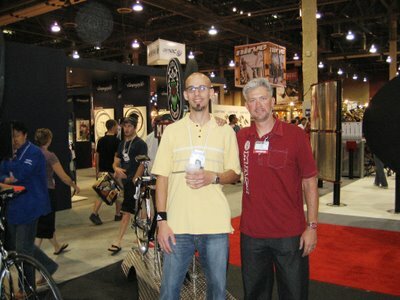 Interbike 2006 has some simple highlights. Here is one of my fav pix. 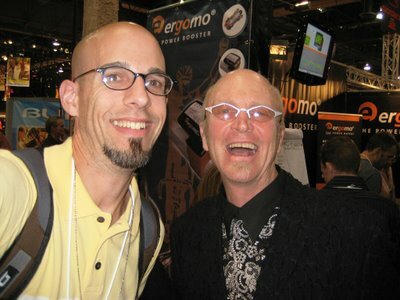 Me on the left and Masiguy on the right. As you can see his attempt to get me sloshed and write a large Masi order for next year almost worked, Ha! Just kidding. Thanks for the Masi necklace. 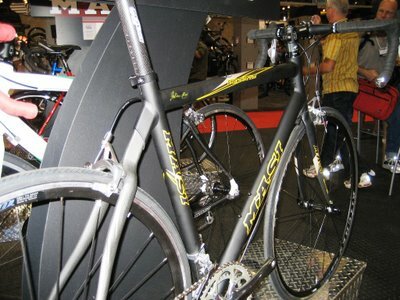 Tim Jackson is the Iatola of Bike O'la or plainly put the brand manager of Masi Bicycles. He spearheads the bike development and spec'ing of the best damn bikes I've ever thrown my sticks over. What major issue does Masi and BMW share every year? Anyone? Anyone, Bueller, Bueller? Making their flagship model better is the answer to that question. The Masi Gran Crit is going on a couple decades now and today is sporting a bitchin' matte black finish over aluminum/carbon tubing, sturdy hoops and SRAM! The GC is your choice for fitness, training, sport racing or grand fondo. Why not, everyone in the shop were I work rides one ! Haro is entering the 6in. all mountain market with a fine piece. The Xeon. I have been riding a 6in bike all summer and all I can say is why 5? We all can use an extra inch right?... Set up the sag where it needs to be and burn in the pads and there won't be too many places you can't ride. Hell, I pedaled my 32lbs pig this summer up the wall at Rocky Ridge, in my middle ring. Ya, fun baby! 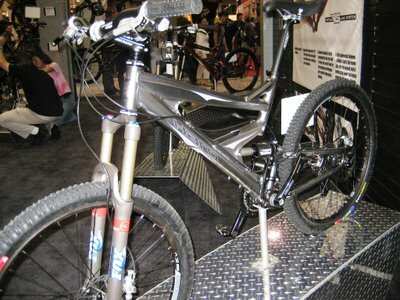 The Xeon is utilizing the new Virtual Linkage from Haro engineering wizards. This design on the VL120 nabbed the mountain bike of the year award by Mountain Bike magazine and gave a lot of this past summer's editors a run for their money when tested against bikes almost a grand more! Be prepared to pay to play as this platform starts above 2k. Here is another major highlight of my trip. 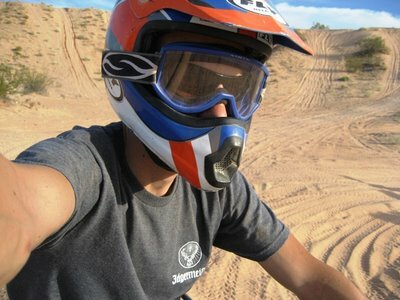 Taking a half day Wednesday to go riding some ATV's in the desert. Heck ya! 3 hours of suckin' dust and loved every minute of it. My goggle strap was slipping down in the shot here. UGH! The guided tour served us lunch and drinks to keep us rolling. I can't believe the amount of BLM property in Vegas. You can go riding almost everwhere!